A new dramatic version of how Norway’s oil industry began was making its debut on Tuesday at the first Cannes International Series Festival. The new Norwegian series is the biggest TV drama ever produced in Norway, based on events that also changed the nation forever. 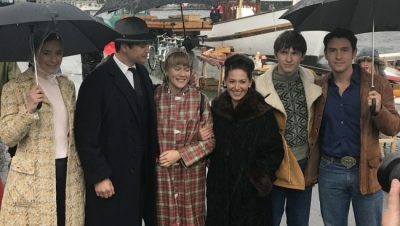 Called Lykkeland (State of Happiness for its foreign audience), the series starts in the summer of 1969 in the then-financially struggling coastal town of Stavanger. The first eight episodes track how the discovery of oil and the lighting of a gas flare right at Christmastime fueled major personal, social and political changes during the next three years until Norway’s state-controlled oil company Statoil was founded in 1972. Those changes have been going on ever since. 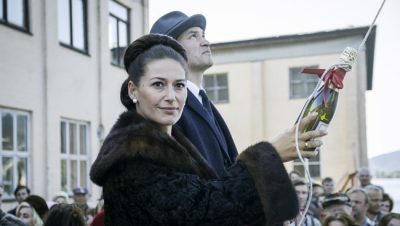 The series won’t start running on Norwegian Broadcasting (NRK) until this fall. The first two episodes, however, are premiering in Cannes after the series was chosen to compete along with nine others from around the world. Organizers claim their first Cannes International Series Festival is meant “to give an international voice to this increasingly popular and fiercely creative new art form.” The festival is also taking place alongside the major TV industry conference MIPTV this week, adding to its international exposure. Lykkeland (State of Happiness), produced for NRK by Maipo Film of Norway, received the lion’s share of financial support in 2016 from the Norwegian Film Institute, amounting to more than 10 percent of its total budget of nearly NOK 100 million (USD 13 million). That makes it the most expensive drama series ever, with top Norwegian film- and TV-industry figures behind it. It’s directed, for example, by Petter Næss, whose classic film Elling was nominated for an Oscar as Best Foreign-Language Feature. The screenwriter is Mette M Bølstad, who’s also had success with the series Nobel and Kampen om tungtvannet (Heavy Water War). “For me, this has been a dream project,” said one of the stars of Lykkeland/State of Happiness, Norwegian actress Pia Tjelta. She plays the wife of a Norwegian shipowner whose family business is saved from collapse by a decision to invest in vessels tied to the oil industry. They experience both despair and a sharp rise in fortunes. The series otherwise revolves around four young people in Stavanger and how the oil boom changed their lives. Synnøve Hørdal of Maipo Productions, who hatched the idea for the series, said she was thrilled that the series was chosen to be shown in Cannes. “Until now, it’s mostly been Nordic crime series that have been exported abroad,” Hørdal told Dagsavisen. “Now we’ve managed to come out with something from Scandinavia that’s not crime.” Lykkeland/State of Happness is the only entry from the Nordic countries at the festival in Cannes. Hørdal and others were nervous about what the first reaction would be like in Cannes this week but they’re most keen to see how it will be received at home in Norway. The oil industry and the management of its huge revenues over the years have turned a once-poor nation that produced hundreds of thousands of emigrants into what’s now one of the wealthiest and happiest countries in the world. The oil industry, which generated NOK 87 billion for the state treasury last year just through the state’s own direct investment in oil fields, remains controversial, however, because of the environmental and climate damage it can cause. Efforts continue to find economic alternatives to oil and gas, with seafood ranking as Norway’s next-biggest export business, but the oil industry is expected to remain a major force for decades to come.